Welcome! I’ve decided to try self-hosting this blog – it may not see me posting more often, but I do want to make it more “my” place. So, this is “The europlus Zone” – I’ll be consolidating things like the files for my Silentype Font under this domain (☑︎ done! ), as well as the pictures I’ve placed on an old site I’d previously hung off my business’ domain (☑︎ done!). 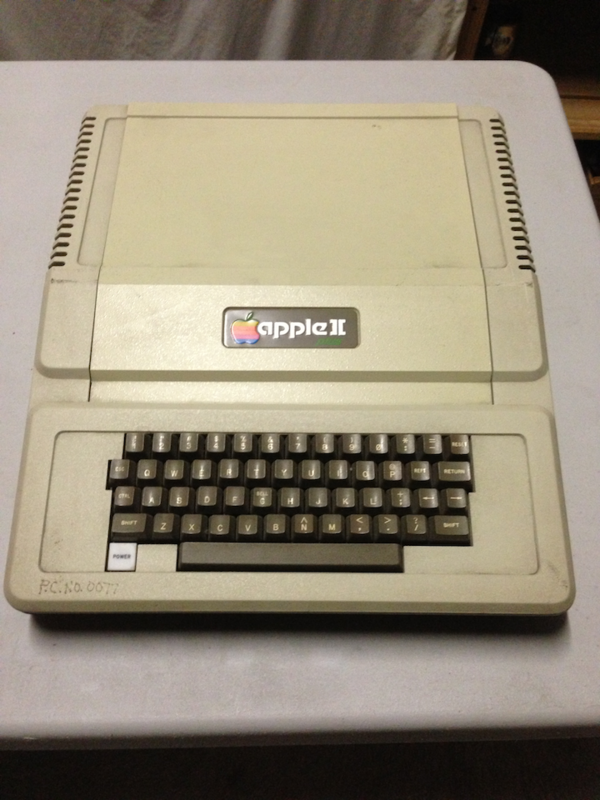 I am hoping, now that our renovations are almost finished, to get back into retro goodness – consolidating and documenting my collection, testing my two Silentypes now I have an Apple ][ interface card for them, mucking around with the Uthernet II, writing a few more posts here and, should I be ready, finally entering the RetroChallenge. Just a quick shout out to David Finnigan of the Mac GUI and A2HQ – without him starting the A2HQ hosting area, I wouldn’t have bothered starting this blog. I’m hardly changing the Apple ][ world, but it is a place for me to share what retro things I have done. I mean, real life really gets in the way, sometimes. Moving, unpacking, re-organising, work, painting, nausea, planning renovations, dealing with strata stuff (as an owner and Executive Committee member), enjoying time with the family and just vegging out at times has seen the time just fly. As I’m sure is not uncommon with personal blogs, my last post was certainly never meant to be “My Last Post”, but it so easily could have been. Even with nine post ideas/drafts in place before my hiatus, it’s taken this long to put fingers to keyboard. This year, however, has seen my Apple ][ interests re-invigorated, and there’ll be posts (and pictures) about the whys and wherefores of that re-invigoration, hopefully shortly. The best intentions often go astray, but I have a cunning plan to keep me on the top of my game, ahead of the pack, my head above water, two steps in front, and…umm…I suppose…umm…posting more often. Well, it’s been 5+ months since I last put finger to keyboard and posted here. An unexpected hiatus brought on by bouts of the ’flu and the trials and tribulations of moving. However, the blog is not forgotten, just temporarily on hold. Issues around the move now settle quicker than they arise, and something secured in our new place is a 41m² (440ft²) storage room, meaning I get to keep my Apple ][ collection at home (let alone at all) with a lot of space left over for workbenches and systems to be permanently set up – there’ll even be room for non-computer stuff! So it’ll be a veritable retro-renaissance for me once we get through a few more move tasks and I start to get benches set up. That’ll also, hopefully, allow and drive a more regular posting schedule here. A quick extra post this week. I’ve just spent a day sorting through some of my computer collection in the garage – we’re moving soon (we hate moving), but we have some time up our sleeves to prepare, so we’ve been sorting through rooms in our current home to get rid of stuff we don’t need. Today’s rummage through my collection was primarily to clean machines which aren’t boxed (and the tops of boxes) so I’m not moving dust into the new place. 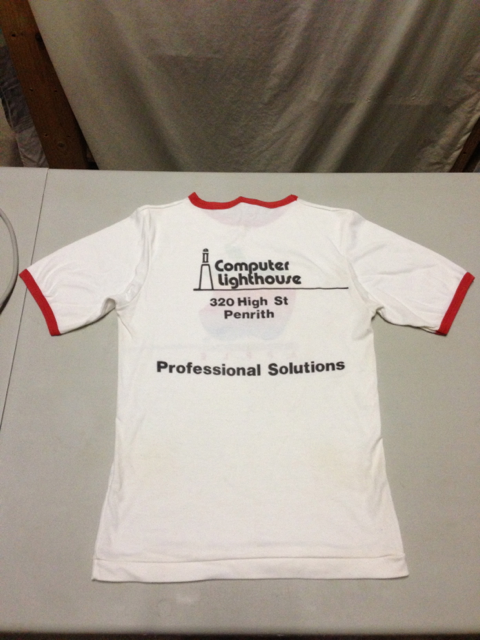 One of the things I found is this lovely t-shirt I got from the dealer we bought our europlus from, Computer Lighthouse (there are two pictures, front and back). The colours are still vibrant but, unfortunately, I think it’s a little small for me these days – I’m sure it must have shrunk over the last 25+ years as it used to be a good fit. 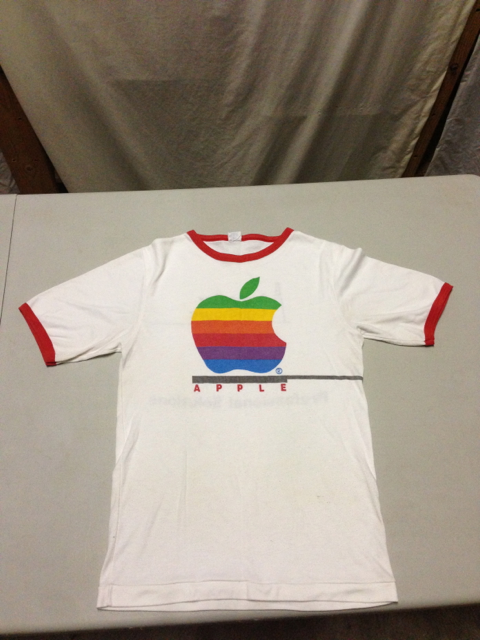 I find it odd they went to the trouble of producing these t-shirts but didn’t bother to put their phone number on them. I have more europluses than I thought – I counted four today (I thought I was up to three). I have two other early ][‘s – one’s missing its lid, and the lid on the other that says it’s a ][+ (i.e. North American), but the colour of the lid’s plastic doesn’t match the rest of the case, so I have some motherboard detective work to do on those (maybe I have the lid on the wrong machine). At least I’ve been able to update my page banner using one of the better ][europlus badge photos I took today (I might play with it a bit more, though). I also have more //c’s than I thought – seven, if my tired brain is remembering properly (there may be more in boxes I didn’t unpack today – there’s certainly one in its original box, and I found a shrink-wrapped Apple IIc Owner’s Manual, too). I might have to put some of the //c’s on eBay. I love the idea of the //c as a compact machine ideal for reliving a collector’s Apple ][ days of yore, but I always find myself firing up a //e or IIgs, instead. Looks like I have six //e’s at home (add those to the one at the office). Not sure about IIgs’s, I think I have three – the final census will have to be a job for after we move. I did start to take photos of the items, their serial numbers, etc. I’ll have to make a database of the collection someday – does anyone know of a good template/schema for a retrocomputer collection database? 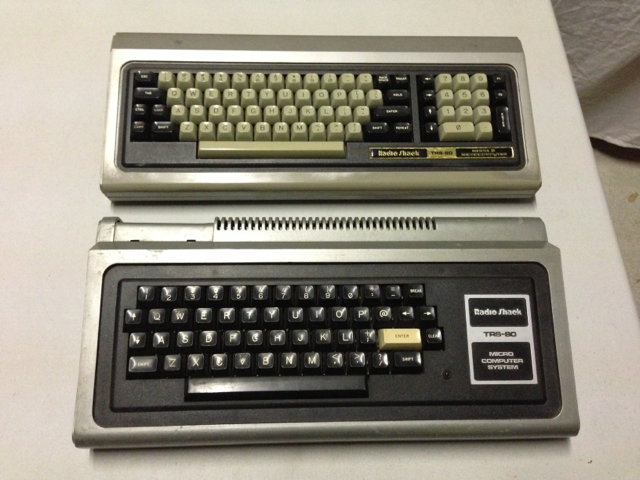 I also found a TRS-80 Model I base unit and a Model II keyboard. Although I still get nostalgic whenever I see a Model I, I don’t have anything but those two base components (don’t even have a PSU), so I think they’re eBay-bound as well. Although I completed the cleaning I wanted to get done today, it’s just made me realise how much documenting and real cleaning I have to do, let alone trying to check that everything’s operational. At least the place we’re buying has a decent amount of storage/work space, so I may actually be able to get back into the nuts and bolts of having a collection, rather than just collecting bits (and the bits collecting dust). Have you looked through a neglected portion of your collection recently? Found any gems? Let me know in the comments.